Many people think that a nursery school photographer and a school photographer are the same thing. But the workflows are very different. As a nursery school (also known as a toddler group) photographer you will be photographing children under the age of five in their school environment. Unlike primary and secondary schools, toddler groups tend to cater to a small number of children and are privately owned. Also, a nursery school photo shoot tends to be organised on a first-come-first-served basis rather than as regimented production line. This is typically because children attend the toddler group either in the morning or afternoon. Generally, toddler group images are more casual and natural than your typical school photo. Most nursery school photographers choose to have no set pose for the children as being under five years old it can be difficult. It’s popular to offer sibling photos as well as the child’s portrait, but be aware that siblings might be babies. This is obviously another route into the baby photography industry. Also, some toddler group photographers offer parent/child images as well which is another way into the family portrait genre. The majority of nursery photographers use a white background (often wipeable) and some studio lights as their set. It’s a good idea to have something that the child can either sit or lie on, especially if you’re photographing small babies as well. Be aware that as you’re photographing children in their school environment you will have to transport and erect your set at every photo shoot so you want it to be as simple as possible. Also you most likely won’t have a lot of space so make sure you’re set is compact and not a hazard when in a small area. Generally between 5-10 images are taken on each child. Often both prints and downloads are offered to parents. Prices range between about £6 for a 6×4 to about £12 for a 12×8. You will most likely have to be CRB checked in order to photograph children in the nursery. Being a nursery photographer means that you are working with very young children, so you will need a huge amount of patience and energy. Remember some children may be shy, while others are more precocious. Try to have some squeaky toys on hand and some simple jokes so you can attract the children’s attention. 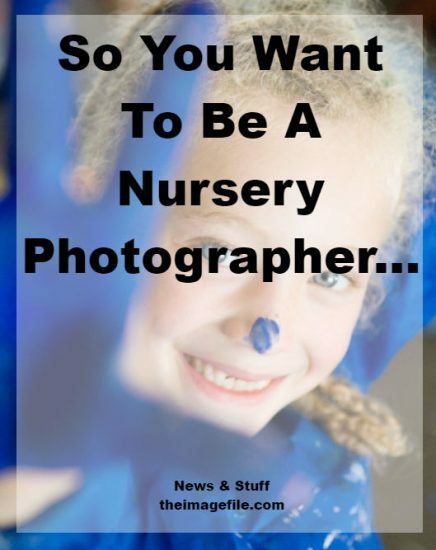 What advice do you have to anyone wanting to become a nursery photographer? The Discount You Need For The January Sales Preparing Your Business For Father’s Day Mother’s Day Page Sets 2017! Christmas Page Sets 2017!